I had so much fun turning a popcorn box into a clown! Since the materials were already out, I decided to decorate another box. This time it's a cockatiel. Enjoy! 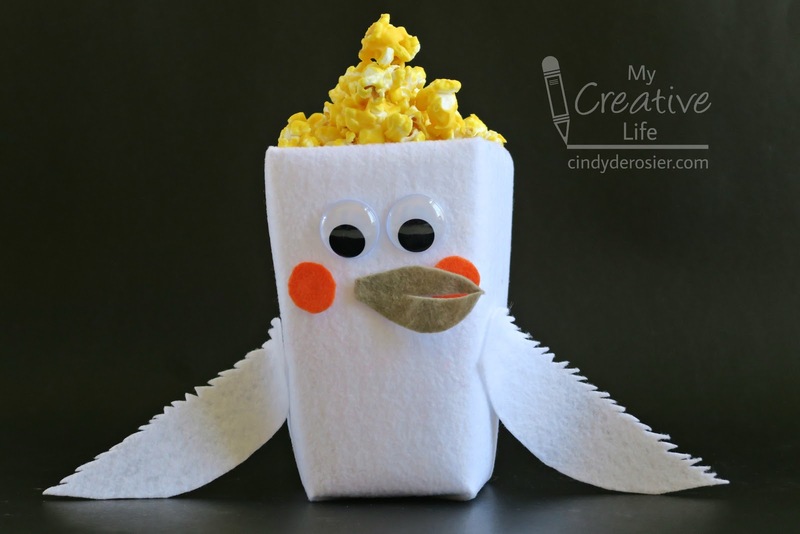 Cut white felt to size and wrap it around the popcorn box. Glue the googly eyes near the top of the box. Cut two orange circles from felt and glue them below the eyes and to the sides. Cut a beak from grey felt and glue it between the orange cheeks. Cut a pair of wings from the white felt and glue them to the sides of the box. Pop the popcorn. Put the candy melts in a bowl and melt them, following the package instructions. Pour popcorn into the melted coating and stir. Spread the popcorn onto parchment paper to dry. Fill the popcorn box with popcorn.